The Sparks topped the Sky, 95-75, to take game 4 of the semifinals and close the series, 3-1. 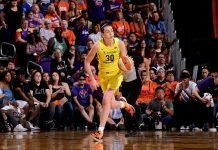 They advance to the WNBA Finals for the first time since 2003, and will face the Minnesota Lynx. Playoff schedule: Oct 9 and 11 in Minnesota; Oct. 14 and 16 in LA. Game 5, if necessary, Oct. 20 in Minnesota. Minnesota will rest before beginning their next title quest. They are back in the Finals, yet again. The Lynx dynasty continues to roar. Minnesota’s path to the Finals. News of this morning: Renee Brown is stepping down as the WNBA’s chief of basketball operations and player relations after 20 years. Brown has been a constant for the league. Diana Taurasi says the Mercury need to toughen up after a disappointing season. Fewer players means more practice planning for Tennessee. New Mexico is full on posts and thin on guards. Kansas State is hungry for deeper postseason success. DePaul junior Mart’e Grays will miss the season with a torn ACL. Jewel May is now making a difference for South Carolina off-court. Notre Dame coach Muffet McGraw said the goal is the same this year: win a national title. Brandon Schneider has built a new home and foundation for Kansas. Navy’s new assistant coach is Ryenn Micaletti.